Business center; meetings and events staff; communications and audiovisual equipment; property-wide Wi-Fi. and walking trails; Segway rentals; children’s programs; and a wide choice of dining options. The JW Marriott San Antonio Hill Country Resort & Spa basks in the beauty of Texas Hill Country just 20 minutes from downtown San Antonio. 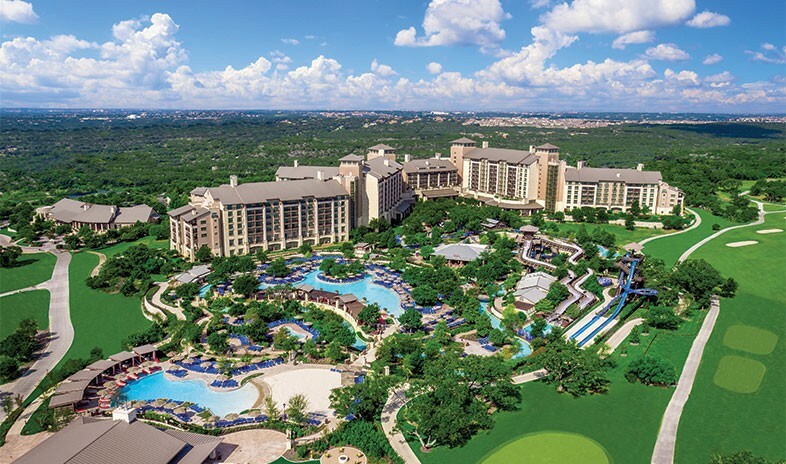 The 600-acre property features 1,002 accommodations, 120,000 square feet of indoor conference space, the 36-hole TPC San Antonio golf facility, the newly expanded River Bluff Water Experience, the 26,000-square-foot Lantana Spa, and a wide array of dining options. Local cultures, contemporary culinary style, and fresh ingredients influence every food and beverage outlet, from the signature Cibolo Moon restaurant and 18 Oaks steakhouse to the Replenish Spa Bistro, poolside Rivertop Grill, Crooked Branch lobby bar, and High Velocity sports bar. The chefs draw on the same elements for custom banquet menus, served on the largest scale in the 40,500-square-foot Grand Oaks Ballroom and 21,000-square-foot Cibolo Canyon Ballroom. The 40,000-square-foot Nelson Wolff Exhibit Ballroom and 19 smaller rooms, plus several outdoor spaces, round out the venue choices. In 2016, the resort also added a new indoor/outdoor meeting and event pavilion. A dedicated meetings staff and the latest equipment guarantee seamless presentations and a flawless flow from event to event. Between sessions, attendees can personalize their idea of the ultimate Hill Country getaway, whether at the golf course, water complex, or spa, or on guided Segway tours, GPS adventures, bike rides, nature walks, or stargazing outings. This is one of my favorite venues in the country. The staff is excellent, the rooms are great, and the overall value cannot be surpassed. This hotel and conference facility is sheer perfection. Everything was amazing from the conference services staff to the food to the golf experience and spa experience. First class all the way. They even have a ranch to take groups to that is extraordinary, Kibbe Ranch. Complete with Texas Longhorns. The lobby is great for groups to network in. The lazy river is picture perfect. Trips to the Riverwalk and Alamo are close - less than 20 minutes by bus. The golf on property can't be beat. They cater to groups. Great hotel; beautiful setting in the hill country. Food and beverage offerings were creative and high quality. Great property. For a 1 or 2 day business meeting, this is an ideal venue. However, for longer events, I would want something with easier access to nightlife and other activities. Overall, great experience at this hotel!! The only draw back was that my program coincided with Texas' spring break and there were HUNDREDS of children underfoot, which packed all restaurants. However, the hotel had only been open 6 weeks when I had my program and I think they did a fabulous job trying to accommodate both their leisure and corporate guests. This new JW Marriott is absolutely fabulous, set in the hill country with wonderful views. A warm Texas welcome awaits you by bell and check in staff with the exuberance only a Texan can provide. This hotel has thought of everything...a relaxing spa, pools to meet every need from children to adults that can relive their youthful days enjoying the 3 slides available or floating down the lazy river. A gift shop to rival all, dining choices ---I believe I counted six, state of the art Meeting & Conference space, accommodations that house original artwork, they have thought of your every need. My sales person was like no other. Ever attentive, responsive, with attention to detail made me feel I was on vacation! The food and beverage was not only eye appealing but delicious! The meeting venue was set to my expectations with staff that could not do enough. I love this JW Marriott and would return for a meeting or a relaxing getaway...what a delightful experience.